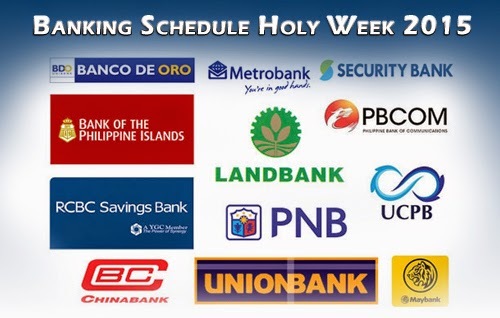 SCHEDULE: Philippines Banks Holy Week 2015 (BDO, BPI, MetroBank, PNB and other banks) - Balita Boss! Selected branches of banks in the Philippines will be open during Holy Week, but majority of the financial establishment will be closed from April 2, Thursday to April 5, Sunday, according to their advisories. Regular banking operations will resume on Monday, April 6. Here's the 2015 Holy Week advisory of Philippines major banks. BDO Unibank, Inc., commonly known as Banco de Oro and BDO, announced through its website that their branches will be closed from April 2 to April 5, except for NAIA, NAIA 3, BDO Clark Forex Counter, City of Dreams Manila and Solaire Manila Resort which are open on April 4 and 5. Based on the abs-cbnnews.com report, all branches and kiosks of BPI and BPI Family Savings Bank will be closed from April 2, Thursday to April 5, Sunday. Regular banking operations shall resume on Monday, April 6. According to Metropolitan Bank and Trust Company, commonly known as Metrobank, through its official website announcement that selected branches will be open during the Holy Week. View the list of Metrobank branches that are open and banking hours here. In an announcement made by the Philippine National Bank (PNB) through its official Facebook page, "PNB is open this Holy Week! Selected PNB branches are open on April 2, 3, 4, and 5." On its Facebook page, Security Bank said that they will be closed starting April 2 and normal operations will resume on April 6, Monday. During these days, Security Bank Online and all Security Bank ATMs are available for banking services. For United Coconut Planters Bank (UCPB), through its official website, all branches will be closed from Maundy Thursday to Black Saturday. ATMs and electronic channels will remain available for balance inquiry, fund transfer and bills payment needs. Maybank Philippines said on their website that all their branches will be closed from 2 to 5 April 2015, including the Main Office and Resorts World Branches. PSBank's 246 branches will close after regular banking hours on Wednesday, April 1, and will resume regular operations on April 6, Monday. However, its ATMs nationwide will continue to operate and accommodate withdrawals, inquiries, and other bank transactions during the Holy Week break, according to gmanetwork.com report.